Why does a bookseller produce a catalogue full of letters and photographs? Especially a bookseller who specializes in works by and about Winston Churchill? It’s is not as if we lack material. Churchill left us a staggering volume of published work. 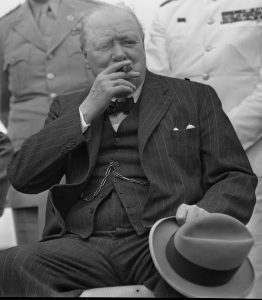 More than perhaps any leader before or since, Churchill chronicled the arc of his vast experience, versatile mind, and the extraordinary time he so fully inhabited. And he didn’t just write prolifically. He wrote with extraordinary grace, power, and skill. Churchill was a politician who managed to win the Nobel Prize in Literature. Published work has limitations – limitations inherent to the very acts of drafting and editing, of expert input, careful consideration, and diligent preparation. Readying words for publication can dull and distance them even as they are polished. Render remote a compelling context. Deprive the immediacy of a moment or perspective. Leave the ink a little too dry on a paper that’s just a bit too clean. Correspondence and photographs are different. More ephemeral. More candid. More distinctly in and of the moment. Able to impart a vital sense of things that no acclaimed book or carefully crafted speech – however Churchillian in its mastery – can quite capture. So even though Churchill left us a wealth of published words and images, there is more yet to see, to learn, and – critically – to feel from letters and photographs. Hence our new catalogue. 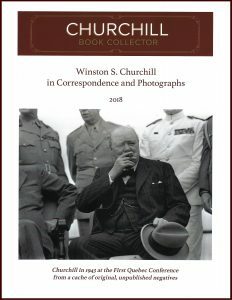 40 items spanning nearly the entirety of Churchill’s twentieth century experience, from 1903 to 1965. Personal correspondence in our catalogue includes letters from, to, and about Churchill. 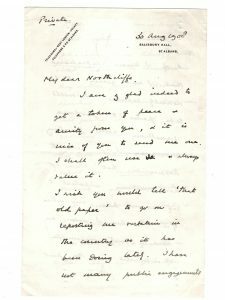 Churchill’s own letters are to press moguls like Hearst and Northcliffe, to his publishers and literary team, and even to his paint supplier. Letters about Churchill are equally compelling. 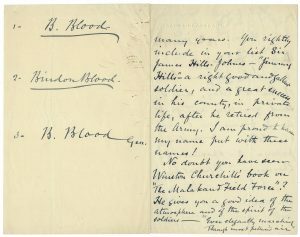 Letters by General Sir Bindon Blood about Churchill’s first book. A letter from Churchill’s literary assistant threatening his publisher with “a second gathering storm about to break!” over typos in the first volume of The Second World War. And a particularly poignant letter observing Churchill at the Savoy Hotel in 1961. Images are equally compelling. Among them… Press photos of Churchill learning to fly before the First World War. 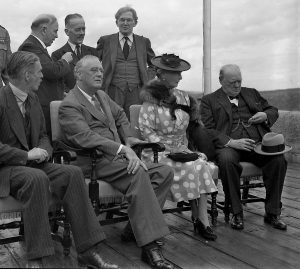 An exciting discovery of unpublished photographic negatives of Churchill and Roosevelt from their 1943 conference in Quebec. 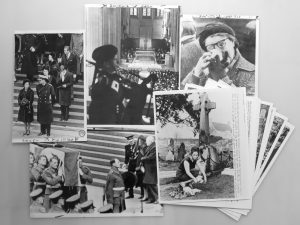 An archive of press photos from Churchill’s state funeral including annotated and edited images. It has been a privilege to handle this material. We hope you enjoy perusing the catalogue as much as we enjoyed creating it. Very exciting to view history through a different lens that has a lasting impact. Keep up the excellent work.